that caught — they say — God, when he walked on earth." Robinson Jeffers died at Big Sur, California, on January 20, 1962 — a year to the day after Robert Frost spoke at the Kennedy inauguration. "The poetry of Robinson Jeffers shines with a diamond's brilliance when he depicts Nature's beauty and magnificence. 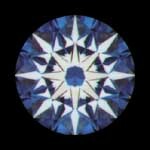 His verse also flashes with a diamond's hardness when he portrays human pain and folly." Enter the pure Euclidean kingdom of number…." "In the last two weeks, I've been returning to Hopkins. Even in the 'world's wildfire,' he asserts that 'this Jack, joke, poor potsherd, patch, matchwood, immortal diamond,/Is immortal diamond.' A comfort." "There's none but truth can stead you. Christ is truth." "The rock cannot be broken. It is the truth." Here, but a dark one, deep in the granite…." On this date in 1993, the inauguration day of William Jefferson Clinton, Audrey Hepburn died. "…today, the Rock cries out to us, clearly, forcefully…." 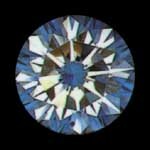 Had come young Porphyro, with heart on fire"
What you see with a Hearts On Fire diamond is an unequalled marriage of math and physics, resulting in the world's most perfectly cut diamond. "Eightpointed symmetrical signs are ancient symbols for the Venus goddess or the planet Venus as either the Morning star or the Evening star." "Set me as a seal upon your heart, as a seal upon your arm; for love is strong as death, passion fierce as the grave. Its flashes are flashes of fire, a raging flame." "The last words from the people in the towers and on the planes, over and over again, were 'I love you.' Over and over again, the message was the same, 'I love you.' …. Perhaps this is the loudest chorus from The Rock: we are learning just how powerful love really is, even in the face of death." We don't get fooled again." See also my note, "Bright Star," of October 23, 2002.